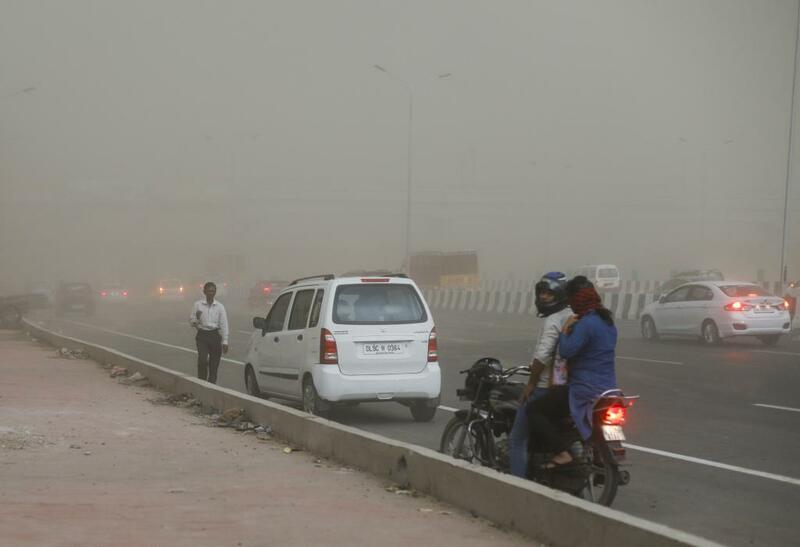 During May 2018, the National Capital Region and parts of North India were lashed by three strong dust storms in quick succession. In addition to the widespread damage they caused to property and human life, these storms caused changes in air quality and atmospheric chemistry which may be harmful for human health, a new study has reported. The dust storms led to significant changes in the wind speed, temperature, and patterns of vertical transport of atmospheric parameters, altering concentration of some greenhouse and trace gases that are detrimental to air quality, the study has found. Two of the three dust storms during May last year were hazardous and killed over 100 people while injuring several hundred more. Dozens of flights were either cancelled or diverted. Most dust storms over the Indo-Gangetic plains originate in the Arabian Peninsula and Thar desert areas and are known to contain nitrates that get converted into oxides of nitrogen through a process called re-noxification. “An increase in ozone precursors — carbon monoxide and nitrogen oxide — takes place after major dust events, which is likely to enhance surface ozone. Such processes also increase PM2.5 and PM10 and harmful greenhouse gases at the surface that has an adverse impact on human health,” researchers have concluded. The link between increase in surface ozone and dust is important and has been observed during other dust events as well. For Delhi, the study said, the increase in surface ozone is particularly strong, while it was far less in Kanpur, indicating the gradual migration of dust storms further inward. The findings are based on observations from ground stations, satellite data, radio-sounding data from balloon networks, besides global climate models. The ground data came from AERONET network of NASA which has stations in Delhi, Kanpur, Ballia, Jaipur as well as Karachi and Lahore. Data about pollution levels was sourced from stations of the Central Pollution Control Board and also from the American embassy in New Delhi. In addition to changes at ground level, there was a distinct shift in aerosol loadings, size distributions, temperature and humidity patterns from surface to lower troposphere. “Such shifts are accompanied by changes in distribution of major trace and greenhouse gases all of which can lead to perturbations in radiation balance, impacting the lower and middle troposphere regions,” the study said. “The dust storms have both short and long-term impacts and some of the short-term impacts can have very real consequences for human health. Mainly, the damage to air quality is seen to come from an increase in aerosol concentration, increases in respirable suspended particulate matter like PM 10, PM 2.5 and also temporary fluctuations in tropospheric greenhouse gases like carbon monoxide and ozone,” explained Sudipta Sarkar, a scientist at the NASA Goddard Space Flight Center and a member of the research team, while speaking to India Science Wire. “Ozone is especially important as the interplay between surface ozone and dust events has not been fully documented before and in that respect, we show that there is definitely some inter-relationship and you would expect some level of surface ozone increase and consequent health impacts,” he added. “The extreme heating of land to the north and west of India creates additional winds into India which fuel both widespread floods during the monsoon and dust storms during pre-monsoon months. These systems can be predicted as they trek into India so early warning systems can definitely be developed. It also means that mitigation effects in terms of greening and land use change may not be sufficient as remote source regions continue to warm,” explained Raghu Murtugudde, professor of atmospheric and oceanic science at the University of Maryland and visiting professor at IIT Bombay. He was not associated with this study. What triggered the dust storms?